That crazy day over a year ago, when I decided to press publish on my first blog post - I had no idea where this would go. Would people actually read my recipes? Could I help others learn that eating healthy and feeding your entire family a wholesome diet is possible in today's crazy, busy world? Would anyone take a minute to read my blog when there are so many beautiful blogs out there with gorgeous photos, painstaking artful posts - when I clearly snap a pic with my iPhone and share my recipes in the midst of life as a mom? When I sign into my blog and see that thousands of you come here each week to try my recipes and see what else is going on here, it blows me away. Thank you - to each and every one of you - because when I started this, gosh, there were so many fears. I considered taking photography lessons - but confession, I have zero interest in learning how to use a camera. Food is my passion and I truly don't believe spending hours composing the "perfect" photo is what this blog is all about. First and foremost, I am a Mom - my kids are my priority and honestly, what you see here, is what you get! I share my easiest, most family-friendly recipes here and hopefully that is what you come here for - I write this because today I just wanted to share this recipe. A recipe so simple, but I know many of you struggle with your kids eating fish - and salmon is just chock full of amazing health benefits, so let's get this in the kid's bellies! My kid's gobbled this up, even after some complaints of "no, not salmon again, Mom" - yeah, salmon is a frequent menu item on our dinner table! Plus, the hub loved, it too. Anytime my guys clean their plates and ask for more, I know it is blog-worthy! This recipe could not be easier - you guessed, BBQ sauce + salmon = yumminess. 1. Place salmon on baking sheet, skin side down, season tops with salt and pepper. 2. Bake for 10 minutes. 3. Remove from oven, top evenly with BBQ sauce. 4. Bake an additional 5 minutes until salmon is opaque and flakes easily with a fork. Serve immediately with side dish of of your choice - pictured with The Best Oven "Fries", asparagus, and tangelo. This is seriously one of those dishes, where you will ask yourself "why didn't I think of this before?" - unless you are way ahead of me and already know how awesome it is! Are you ready for summer? 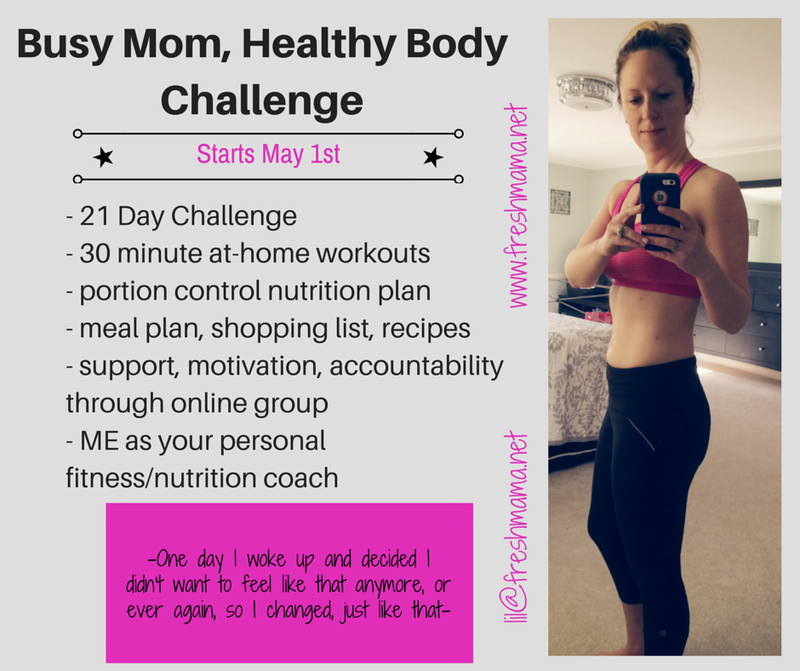 Guess what, it will be here before you know it and my next Busy Mom, Healthy Body Challenge starts May 1st - so fill out this easy online form to get started!